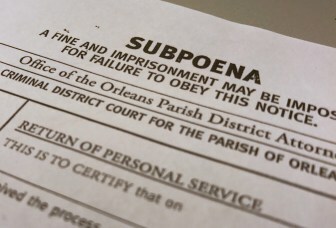 One of the people who received a fake subpoena from the Orleans Parish District Attorney’s Office earlier this year told The Lens she was threatened twice with jail time if she didn’t come in for questioning — once when the notice was delivered and again on the phone. The second threat occurred after her lawyer had gone to court to get a judge to rule that the notice had no legal backing. Depending on who at the DA’s office spoke to the woman, that could be a violation of ethical rules, according to a Loyola University law professor. Orleans Parish District Attorney Leon Cannizzaro has come under fire for sending fake subpoenas to reluctant witnesses. “A FINE AND IMPRISONMENT MAY BE IMPOSED FOR FAILURE TO OBEY THIS NOTICE,” the notices declared. “No wonder people in our community don’t trust our criminal justice system,” New Orleans Councilwoman Susan Guidry said Thursday. The Orleans Parish District Attorney\’s Office is sending out notices like this that threaten jail time if people don\’t come in for questioning. But they\’re not legal documents because they haven\’t been authorized by a judge. Wednesday, after The Lens informed the DA’s office that it was about to publish a story reporting that legal experts called the fake subpoenas unethical, if not illegal, the office abruptly announced it would stop using them. State law requires prosecutors to ask a judge to issue a subpoena if they want to interview a witness in private. Instead, the Orleans and Jefferson Parish district attorneys just sent out their own “DA subpoenas.” They had no legal authority to do so. Fayona Bailey didn’t know that. In early March, two people who said they represented Cannizzaro’s office showed up at her home. They handed her one of these notices and demanded she come in for questioning. The notice looked real to her, she said. “I don’t know anything between fake or real or anything. When they said jail, I thought it was serious,” she said. She learned later that they wanted to know if she had rented a car involved in the murder case against her ex-boyfriend, Janero McBride. Bailey told The Lens she had nothing to do with the car. Bailey said the two people at her door wanted her to sign the notice to acknowledge she had received it. She told them she had an attorney. Have you received one of these fake subpoenas? We want to talk to you. Email editor@thelensnola.org, or call or text 504-229-2346. Chris Bowman, an assistant district attorney and spokesman for Cannizzaro, did not respond to a request for comment on this story. One of the assistant district attorneys who tried the case did not return a call. Another declined comment. Bailey is one of three people who The Lens has confirmed received these notices. In two of them, people with ties to the defendant received them days before the trial. Jefferson Parish prosecutors said Thursday they would end the practice immediately. On March 15, the day before Bailey’s appointment with the DA’s office, she got a call from someone there reminding her to come in. She said the person told her she could be jailed if she didn’t show up. Earlier that day, her lawyer Anthony Ibert had filed a motion to quash the fake subpoena. She doesn’t know who called her. Neither does Ibert. If it was an assistant district attorney or an investigator in the office acting under the direction of an attorney, that call violated attorneys’ Rules of Professional Conduct, said Dane Ciolino, a Loyola University law professor and legal ethics expert. If an investigator did it on his own — without being directed by a lawyer — that’s not a problem, Ciolino said. Regardless, the threats of jail time — verbal and written — are problems, according to Ciolino and an expert in prosecutorial misconduct. Those threats, the false labeling of documents as subpoenas and the citation of state law — they’re all unethical, if not illegal, they told The Lens. Lawyers’ code of conduct requires them to be truthful when dealing with victims and witnesses. The day after Ibert contested Bailey’s notice, Cannizzaro’s office withdrew it and had a judge issue a real subpoena ordering her to appear at trial. She didn’t come. She said she didn’t know anything about the case. Still, she was afraid of being the victim of retaliation if she had gone on the stand. The DA’s office has said that reluctance to cooperate with prosecutors is precisely why they resorted to the official-looking notices. Others have acknowledged those challenges, but say the office still needs to work within the letter of the law. The DA’s office did not obtain a warrant for Bailey’s refusal to appear. That’s because the case was strong enough without her, Bowman told The Lens last week. McBride was convicted of second-degree murder this month.